I started a fierce googling session with search terms such as “best italian pasta”, “marinara sauce”, “italian meatballs” etc. I read through heaps of recipes, many of them very tempting. Unfortunately all of them called for some ingredient or two I didn’t have, and I definitely wasn’t on a mood for a shopping trip. Luckily one of the joys of cooking is improvising. I decided to use whatever I happened to have in hand… The result? Preheat the oven to 175 C (350 F). Mix all the meatball ingredients well; make sure the spice mix is evenly distributed in the ground meat. Thanks again, Meena, for introducing me to the wonderful world of Shan spice mixes! Roll the meat into small balls with your hands, and set aside. Makes 30-40 meat balls. Heat a little bit of olive oil in a pan, and saut? the onions and garlic until golden brown, about 3 minutes. Add the rest of the listed ingredients, and simmer over medium heat for 20-30 minutes. When the sauce is ready, pour a little bit in a 10-15 cm deep baking dish. Add the meatballs and the sauce in layers until everything is in the pot covered in sauce. Cook for 45-60 minutes. Serve on top of pasta with grated parmesan reggiano. I really liked the contrast of the black sepia colored pasta, definitely worth trying! I love everything lamb (and goat), so the meat balls were good, IMO. The pasta sauce was nice too; I especially liked the aroma of the kaffir lime leaves and the tamarind paste. 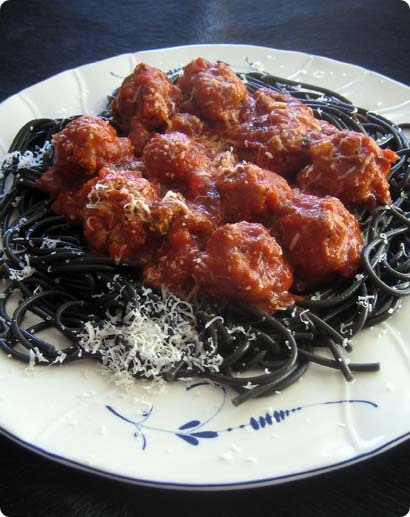 This recipe was influenced by various recipes I saw while looking for the ultimate meat ball & sauce combo. I’d be foolish to compare my resulting dish with those tried and true Italian recipes many of you know, but I enjoyed eating mine with its many tastes from around the world. Pille: I love all meaty animals alike – anything with a face goes ;) But I must confess cows have a special place in my heart and tummy. Or my waist. Hmmm. Because of my stupid diet I’ve tried to cut back on fatty yet delicious cuts of meat, and thus eaten way too much fish, veggies etc. Nothing wrong with that though – veggie food can be and often is super good. But nonetheless I have recurring dreams of braised beef/lamb/goat/pork shanks (especially osso bucco), and various cheap cuts of pork, very slowly braised or roasted. I knew you didn’t fancy fish, but the rest of your list/confession breaks my heart!!! OK, calamari shares genes with a standard issue eraser, but mussels and octopi can be prepared to absolute perfection in both taste and texturewise. As soon as I can find a properly sized octopus in Helsinki (~1 kg), I’ll make insalata di pulpo and worship-blog about it. Meanwhile I should experiment with baby octopi and marinate them. Antti – I do fancy fish, as long there are no bones/glazy eyes/scales on sight! Cod, halibut, salmon, trout, haddock etc fillets are all fine with me (last night’s lenten buns were preceded by seared trout fillets with dill&garlic crushed potatoes). Your pulled pork dish sounds heavenly. If persuaded, I might consider trying a scallop to start with. Maybe.. Calamari is not eraser! Say it with me! I love all seafood and find myself but I luuuurrve lamb. That is some delicious lamb meatballs! Eclectic food from all over the world … my favourite kind of cuisine. WOW!!! 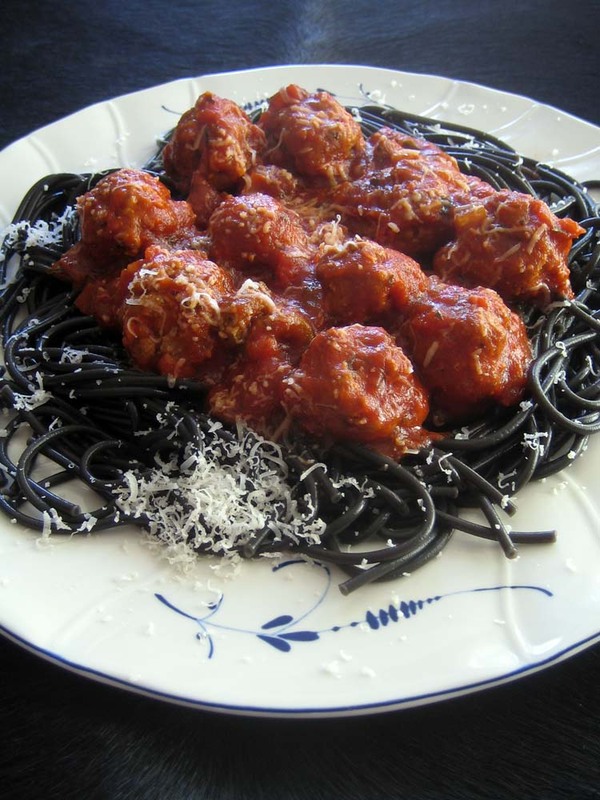 Ive never seen spaghetti look like that!! How do you make it that way? ?